Health and safety is our uppermost concern here at 7 Bays Scaffolding. The importance of scaffolding safety can never be underestimated, so we do everything within our power to ensure that the scaffolding we erect adheres to all health and safety regulations and is as soundly built and safe as can be. We make sure that we are up to date with the latest changes to safety guidance and good working practices within the scaffolding industry to ensure that we are among the best scaffolders in Cornwall. Scaffolds should be designed, erected, altered and dismantled only by competent people and the work should always be carried out under the direction of a competent supervisor. This is a requirement of the Work at Height Regulations 2005. When the weather is cold, wet and windy, risks increase and the need for safety is paramount. Falls and trips can be the biggest risk for scaffolding users all year around, but when planks are slippery following rain, ice or snow, falls and trips are a particular risk. It is a requirement of the Working at Height Regulations 2005 that all scaffolds are inspected (at intervals no greater than 7 days), or following bad weather. 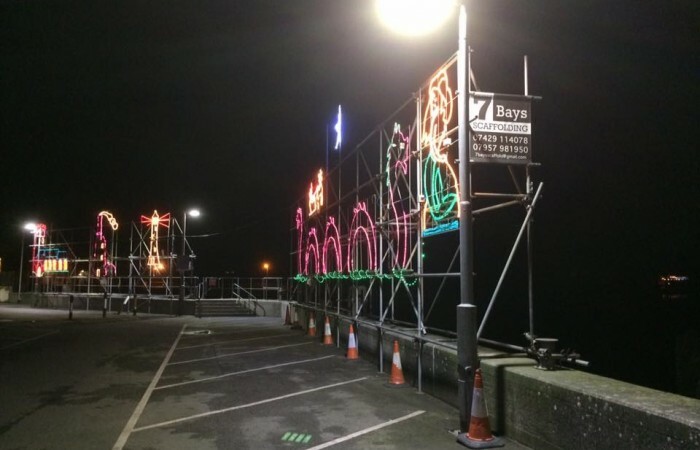 Here at 7 Bays Scaffolding we carry out regular safety checks and risk assessments on your scaffold structure and, where necessary, we can implement reinforcements to help weatherproof the scaffold. We can also offer scaffold inspection services. Independent Statutory Scaffold inspection and site scaffolding monitoring services are available in accordance with the Work at Height Regulations 2005. Regulation 12 and Schedule 7. Scaffold inspections are a legal duty and 7 Bays Scaffolding offer support services to undertake this key duty on behalf of our clients. The user must be satisfied that the scaffold structure is safe and fit for use and is maintained in good order. Our independent inspectors will provide professional and impartial advice on scaffolding standards. Temporary roofs are also a very good way of protecting your construction site against the hazards of bad weather and keeping scaffolding safe, so we can install a temporary roof for you if your project requires one. Temporary roofs can also help protect against high winds which increase the risk of falls and can make structures unstable, so it’s a good idea to consider extra scaffolding safety measures when the weather is bad. Keep an eye on the weather forecast and if a torrential downpour, extreme winds or severe morning frost is predicted then it might be best to postpone work until the weather conditions improve. Yes you have deadlines to make, but if the weather is atrocious then it’s just not worth the risk! The installation of a temporary roof/encasing your site does help to mitigate this risk, but you need to also assess the risk of your workers getting to and from work and accessing the site. Pausing work to keep your workers safe should be at the forefront of every site manager’s mind during winter months. Working in cold wet conditions can impact the well-being of your workers, as well as affecting their productivity. When employees continue to work in rain, sleet or snow, they put their lives at risk. The boards can quickly become slippery and easily cause slips and falls. Staff working in wintry conditions should take regular breaks in a warm environment to ensure that they stay warm and well. Hot drinks, extra layers of clothing and the chance to take regular breaks will all ensure your staff remain happy and well. The winter months see dark mornings and nights drawing in quickly, meaning working in the dark is unavoidable so lighting and visibility should always be kept in mind . This includes the use of high visibility clothing, spotlights and torches to light up the structure and area of work. When working at heights harnesses should always be worn to ensure that workers remain as safe as possible and their risk of falling is mitigated. This is even more crucial during the winter when there are additional risks of slips and trips so be sure to make your staff aware of the extra scaffolding safety measures required during winter months. 7 Bays Scaffolding teams will always erect scaffolds in-line with the industry standards of SG4:15 (preventing falls in scaffolding). Anti-slip wooden boards can be installed to replace regular scaffolding planks so get in touch if this is something you require. Workers are required to wear appropriate reinforced footwear all year around, but especially when there is mud and ice around as proper work boots will provide the traction needed to help stop slips and falls. 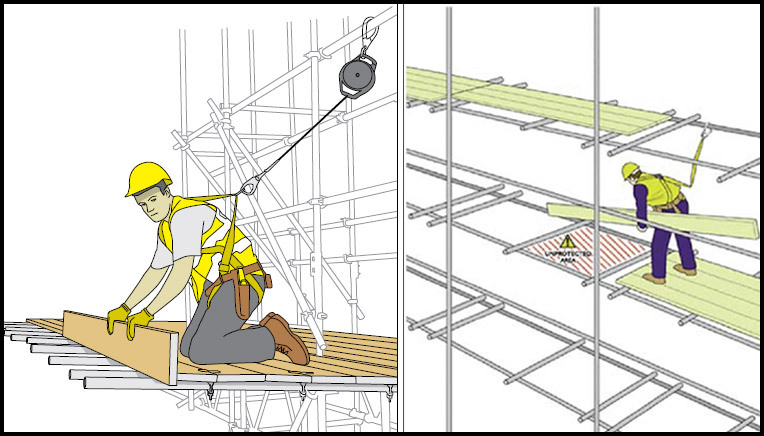 We hope that this guide of extra scaffolding safety tips is helpful to you and your workforce, for more information about 7 Bays Scaffolding’s commitment to health and safety, for quotes or just to say hi – get in touch here. We look forward to hearing from you!